For this Friday's post, I figured I would do a tribute to one of my favorite pets: the Strand Crawler. 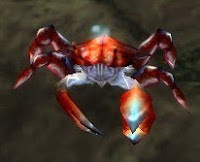 For those of you who do not know, the Strand Crawler is a tiny fiddler crab pet that can rarely be found the Bag of Fishing Treasures you get from completing the level 80 Fishing Dailies. I like him for a couple reasons. First, he is small. I find the exceptionally large pets to be a bit on the distracting side. Second, as he moves around he makes a soft clicking sound. You can definitely hear it, but it is just subtle enough to make everyone around you think: What is that noise? Lastly, he blows bubbles and yes it is as adorable as it sounds! My only problem, I have not thought of a decent name for him yet. Obviously, "Strand Crawler" just isn't going to cut it. So far I have thought of Chett, Lefty, and Captain Markaloney, but I am not quite sold on any of them yet. Wanting for inspiration, I turn to you my readers for guidance! What should I name this little crustacean? Post your ideas in the comments below. The selected name wins the satisfaction of a job well done!